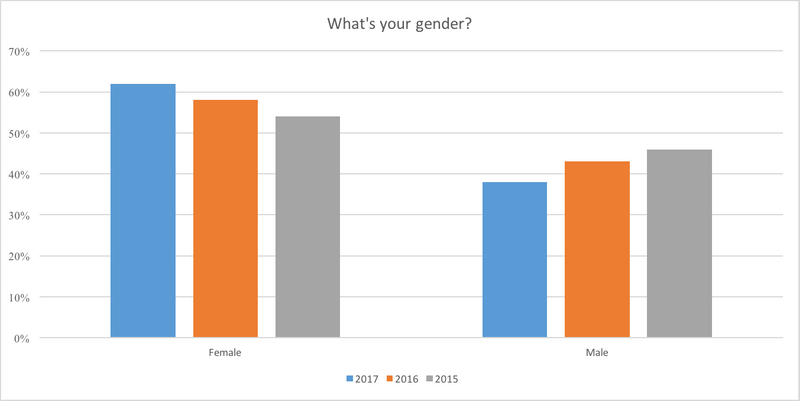 UPDATE: Our original post has been updated to include data from our 2016 and 2017 salary surveys. It all started with a simple question to freelance copywriters: How much money are you earning? 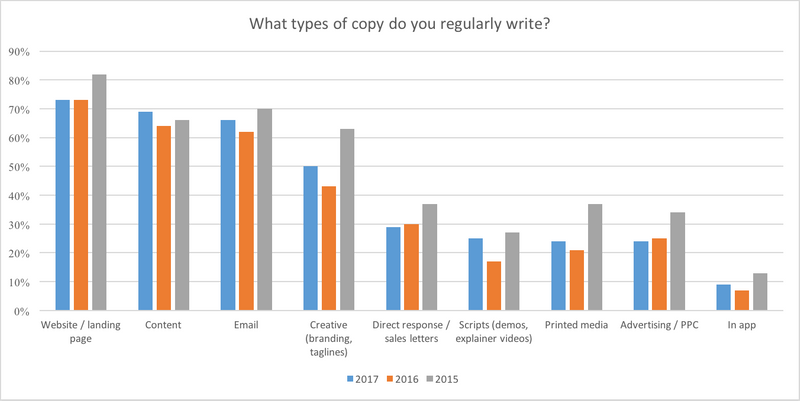 To find the answer, we reached out to copywriters around the world — in late 2014 and again in 2016 and 2017. A multi-year survey is the ideal way to discover trends. Our goal each year is to repeat the majority of questions (to allow for reliable year-over-year comparisons), but we also want to uncover new or emerging trends. 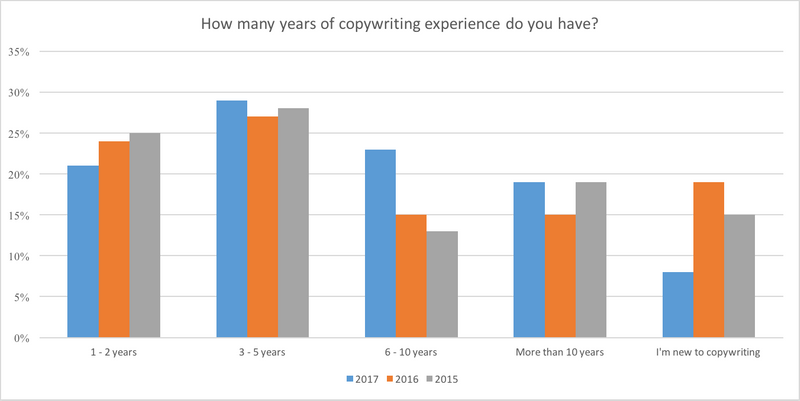 So for example, we included a few new questions in our 2017 survey that were specifically targeted at in-house copywriters and other types of marketers so that we could make some comparisons between them and the freelancers. Before we launch into the data, Joanna and I want to express our sincere gratitude to the all the respondents who completed the surveys and contributed their insights. You made all this possible. Thank you! 1. What does a “day in our life” look like? 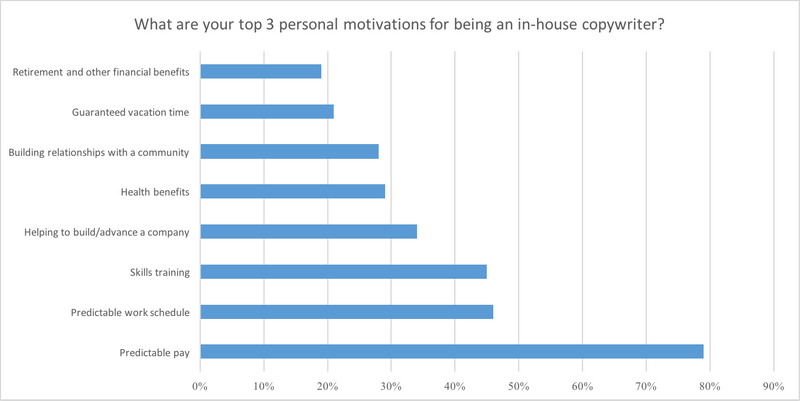 What are copywriters’ top motivations for freelancing? How much experience do freelance copywriters have? What types of copy do freelancers write? How satisfied are freelancers with their work? 2. Where does our work come from? 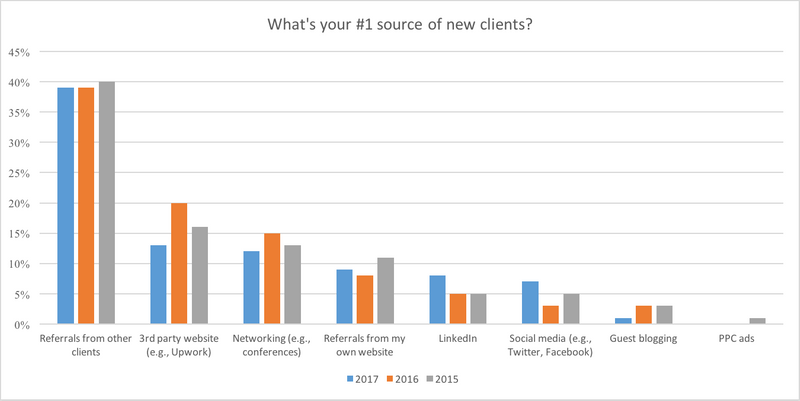 What’s the top source of new clients? 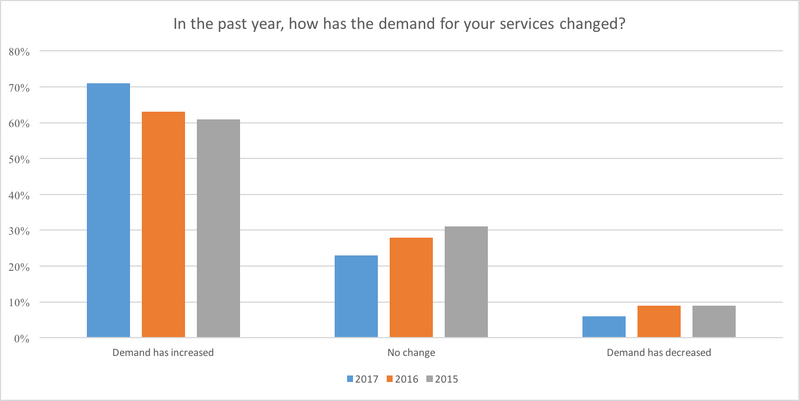 How is the demand for copywriting services changing? 3. What are my peers charging and earning? 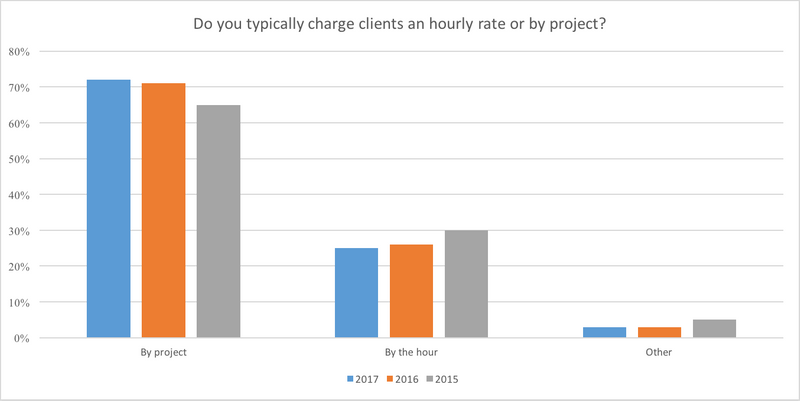 Do freelancers charge hourly or by the project? 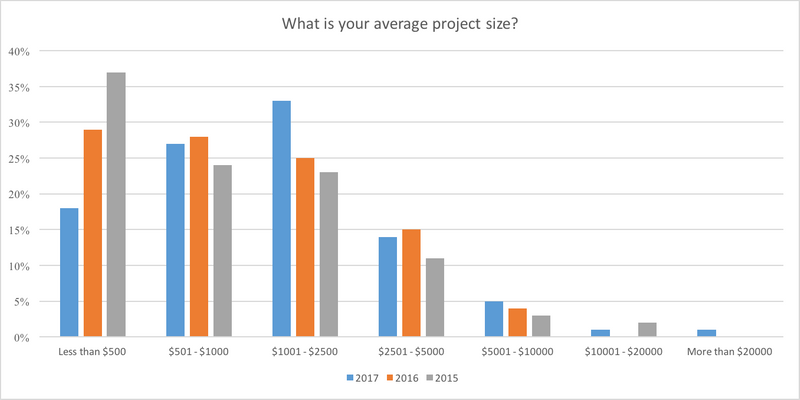 What’s their average project size? How much are freelancers earning? 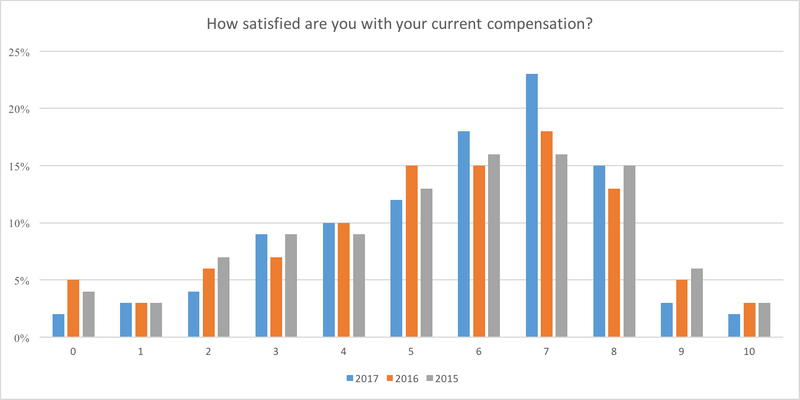 How satisfied are freelancers with their compensation? 4. Should I consider going in-house? What motivates copywriters to go in-house? What do in-house copywriters earn in salary? 5. What about becoming a different type of marketer? How much do CROs, SEOs and other marketers earn? 6. Who responded to the survey? How much experience do freelancers have? On the whole, it appears that we’re seeing a shift to freelancers working more hours — does it feel that way to you? Are we seeing a shift to lower job satisfaction over time? Could an uptick in working hours mean more stress? 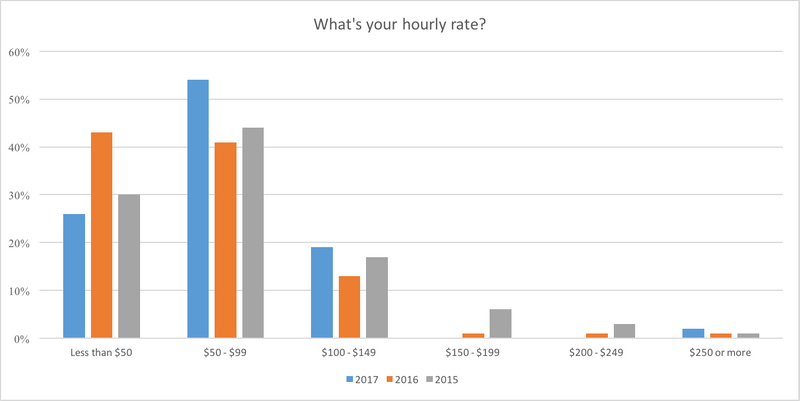 In 2017, hourly rates moved in the right direction: up! If in doubt, follow the trend and charge 10% more! 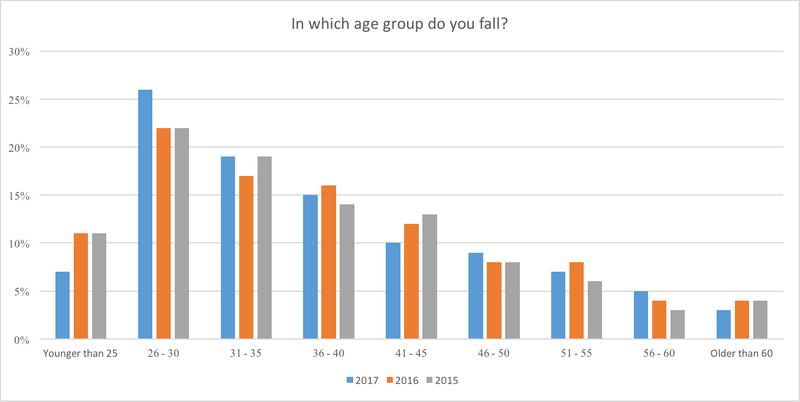 Aside from some minor age and gender differences between 2017 and prior year surveys, the demographics between survey respondents are very similar. 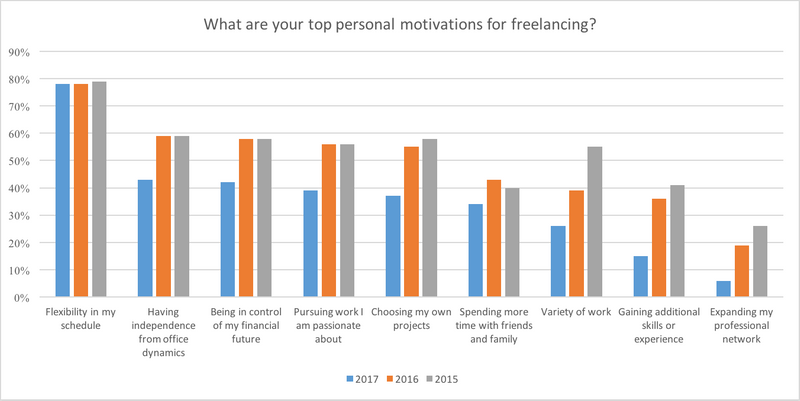 In the 2017 survey, we posed 3 open-ended questions to freelancers… and here’s what they had to say! Think like a marketer, research like a journalist, write like a writer. I refuse to negotiate my rate with new clients. I’ve only ever had 1 or 2 turn me down for that. Self confidence and expertise. However it is not really a problem I face. I qualify my prospects before offering a price. I name drop my fancy-pants clients. But most of my clients are referrals, so they contact me and already know their budget/my value. Quality over quantity is a big one. I’m not here to dash something out and move onto the next job, because I need to complete 100 $5 jobs in a day to make sure I can pay the rent. My brand voice is pretty different and people are drawn to that. ‘Lower-cost competitors’ can all write same-same stuff. I’m fighting it out on UpWork and winning. Once you rise above the fray, UpWork makes it easy. My reviews and testimonials position me far above 99% of the competition. If there’s any waffling over price, I acknowledge the lower-priced competition (ie. the elephant in the room). Then I point out what several clients have told me: A reliable freelancer who understands their business ends up costing less than the trial and error that often accompanies “budget” alternatives. This is especially valuable for companies looking to develop a long-term relationship with a writer. Over time and as I acquire a deeper understanding of the client, writing becomes easier and the hand-holding shrinks with it. That I can’t take on every project I want to. That people don’t value the words as much as I do. That in reality I actually have no idea what I’m doing. That my work is mediocre or not good enough. But then I remember it’s not the client who should be the judge of that but their clients. That I’ll lose the use of my arms. For real. The clients. 😉 I guess I don’t have to explain this to you. There are plenty of knowledgeable ones, but some seem to be intent on diametrically opposing every best practice out there (using you as a scapegoat if it turns out to be the bad idea you’ve already let them know it is, but you end up doing as they asked because you need the monnaie) some don’t end up wanting to pay you, and their brief is usually shite. Turning words into money. I’ve always loved writing, but having an impact on people is the best reward. The thing I love the most about being a copywriter is that I can be creative and persuasive at the same time. I love pretending to be my clients when I write. The inherent joy of creating something powerful, joyous, or thought-arresting. The freedom and flexibility of freelancing. I have great regular clients and a comfortable financial situation (which is why I don’t stress about increasing my freelancing income). The badassery, opportunities for continued learning, self-expression. Not ever going to an office to work where I would be forced to deal with office politics and drama. I love that I’m not beholden to any single client. My background is in television, and I was scarred by some of the personalities – from the unapologetic bully bosses to the supremely disorganized folks who made me wonder if the entire world had been lobotomized. I still encounter these types occasionally, but the fact that I don’t rely on them for my livelihood has made me more assertive. Even more, I never have to work with them if I don’t want to! What questions would you like us to add to next year’s survey? AWESOME survey! So many answers, so much solidarity, and some big revelations for me personally. Some questions related to career growth that I’d love you to ask next time: what do copywriters see as the next step in their careers? (Director of Marketing? CEO of their own agency? Novelist?) And what do they actually end up doing? Also, how many think about scaling up and hiring employees and growing their business? One of the things I’m most uncertain about as a freelancer is where to go from here and how to keep growing my business, expertise, and skill set, especially in the digital economy. Thanks again, Lance! This was phenomenal and I enjoyed sharing it. 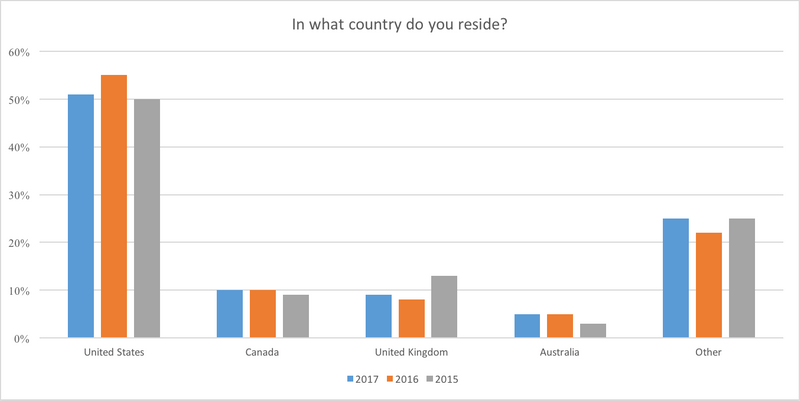 Have the results of the 2016 survey been published yet? Really nice to share this with us team Copyhackers! Lance, I am assuming someone like you and Joanna would be considered freelance even though you have a business and serve as copywriters for your business. Is that correct? Freelancers basically are business owners, so, sometimes the line seems blurred. BTW, loving Airstory!